It’s hardly new news nowadays, but the claims industry is still coming to terms with the Information Commissioners Office (ICO) ruling last year about what consent is needed before you can engage in electronic marketing (text, email and automated voice). From the consumer’s point of view, this fine is another victory for consumer protection, but from the industry’s point of view it’s another example of closing the door after the horse has bolted. The industry as a whole really needs to sit up, listen and read the literature being produced by the ICO and the MOJ or else risk further fines. The automated calls were made by the company and played a recorded message encouraging people to claim compensation for job-related hearing loss. Nuisance calls are bad enough, but picking up the phone to a recorded message can be the most frustrating and intrusive thing of all. That’s why the law is so strict – it’s there to protect consumers and in practice it’s very difficult to make a legal automated marketing call. If you get one, report it. If you’re making one, beware. We will take action. 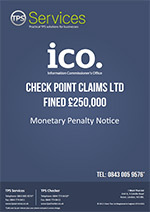 Check Point Claims has gone into liquidation, but the ICO are determined to continue to seek payment. We will do everything within our power to recover fines on behalf of taxpayers and those millions of people who have been hounded by unwanted calls. Even companies that have stopped trading or try to get themselves struck off cannot escape because we will use all means available to chase the debt. From the 16th May 2016, as part of a Government crackdown, cold callers will no longer be able to hide or disguise their phone number. And that will make it easier for the ICO to find and take action against companies making nuisance calls. Read the new rules on Caller Line Identification (CLI) that apply to direct marketing calls. Check Point Claims Ltd sent over 17 million automated calls over a 6 month period, so not a small amount, but they relied upon the assertions of their data suppliers that the data was suitable for automated broadcasting. It is this ‘misunderstanding’ that is causing the claims industry a great deal of pain at the moment. Consent for anything, but especially electronic marketing, is under intense scrutiny by the regulators. The regulators argue that consent must be “freely given” and the age old “selected third parties” statement which has been used widely in the online and offline industry since the start of the internet to create so called “opted in data” will not be deemed by the regulators as sufficient consent for sending electronic messages. Whilst it is difficult to argue with the ICO on this one, and costly to do so, they ought really to accept some responsibility for failing to police this earlier and even now many companies have little or no idea on how the ICO’s recent interpretation of the Privacy Electronic Communications Regulations (PECR) may affect their business.